2016 Emerging Composers Forum Finalists excerpts. 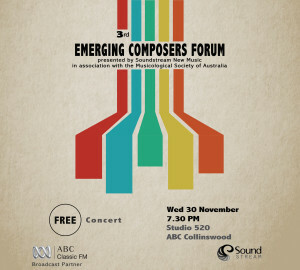 the 3rd edition of the Emerging Composers Forum (28-30 November 2016), Australia’s most lucrative Composers awards was founded and presented by Soundstream New Music. The three-day event was held in the iconic architecture of the ABC’s adelaide Studio 520. The five composers, selected from a national call out, vied for three $5000 commissions. The selected composers were Leah Blankendaal (SA), Mitchell Mollison (VIC), Daniel Thorpe (SA), Alex Turley (WA) and Mark Wolf (QLD). The three day event concluded with a concert of the finalists submitted work held at ABC’s Studio 520 in Collingswood, Adelaide and performed by the Soundstream collective.. 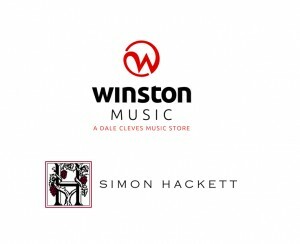 The Finalists were mentored across the three day forum by internationally recognised composers Cat Hope (vic/WA), Alison Isadora (Holland) and Gao Ping (China) and guest Professor Simon Emmerson (UK). In selecting the finalists the mentors commented: “The pieces chosen reflect an exciting diversity in compositional approaches and we are very much looking forward to working with the composers and performers in Adelaide.” the three commissions were awarded to Leah Blankendaal (SA), Mitchell Mollison (VIC) and Daniel Thorpe (SA). Soundstream Emerging Composers Forum, presented by Soundstream New Music in association with the Musicological Society of Australia and our broadcast partner ABC Radio classic fm and supported by winston music, simon hackett wines and the generous support of financial donors.